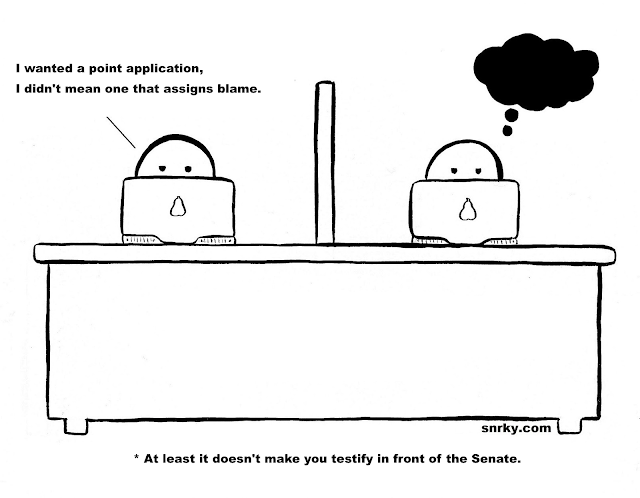 Snrky: At least it doesn't make you testify in front of the Senate. At least it doesn't make you testify in front of the Senate. "HealthCare.gov failed not so much because of its code, but rather because of how it was assembled and rolled out: in secret." But it is important to note that while the implication here is that "operating in secret" is a "bad thing", it is also how most every private enterprise has the luxury of operating. I assure you, if every enterprise launch went through the same level of public scrutiny that healthcare.gov has seen lately we would see a lot less media hand-wringing going on about "technology failures" than we see today. Title: I wanted a point application, I didn't mean one that assigns blame. Snarky: At least it doesn't make you testify in front of the Senate.